A Great Bustard - once thought extinct in the UK - has been spotted near a power station in South Gloucestershire. The sighting was made by the Dursley bird watching group at Oldbury Power Station. The group keeps a record of which birds visits the site. It is thought the bird might be one of a group introduced to Salisbury Plain, Wiltshire, from Russia by the Great Bustard Group (GBG) in 2004. 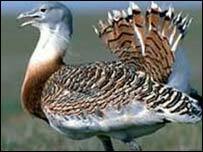 The Great Bustard was wiped out in England in the 19th Century.